Info "Avoid the stars or you'll go POP!" B. Fight is one of 9-Volt's microgames in WarioWare: D.I.Y.. 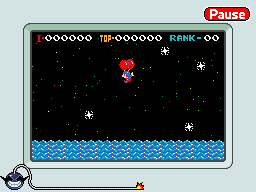 It is set in the Balloon Trip mode of the NES game Balloon Fight. The name was shortened due to a twelve-character limit, although the 13th character is a space. The object is to avoid the lightning bolts and the water. To do that, the player needs to tap the character to go up. If they avoid the lightning and water, the game is won. However, if the player hits a lightning bolt or goes in the water, the game ends in a loss. This page was last edited on October 1, 2018, at 16:17.